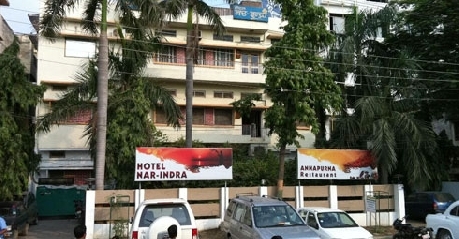 Hotel Nar-Indra is centrally located in Varanasi at Parade Kothi. This is a budget hotel mostly catering to economical tourists and frequent pilgrims.Hotel can be reached from Varanasi Junction railway station, which is about 0.5 km away or from Chaudhary Charan Singh bus stand, which is located at a walking distance. Lal Bahadur Shastri International Airport is only 22 km from the hotel.Varanasi, the city of Ghats, has some of the famous Ghats such as Manikarnika Ghat, Dashaswamedh Ghat and Assi Ghat to experience the River Ganga. Most frequented places of attraction in this eventful city are – Kashi Vishwanath Temple, Ramnagar Fort, Dhamek Stupa and Sarnath Museum. Bharat Kala Bhavan Museum is a must visit place.It is in close proximity to some of the famous markets such as Dashaswamedh Market, Thatheri Bazaar and Vishwanath Road Market for local food and artifacts. 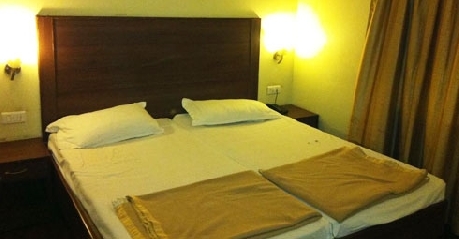 Non-A/c Deluxe rooms are the cheapest listed rooms of the Hotel most popular among pilgrims and leisure travelers to Varanasi. These rooms are provided with twin beds, bedside stool, chair and work desk. An extra person with you can also be accommodated on chargeable basis. The simple features and minimalist appeal of these rooms attract the guests. The room windows will keep the adequate sunlight inside. The in-room amenities in the room are – cable television, STD/ISD calling facility, internet access, in-room safe, round the clock room service, complimentary newspaper and laundry service. The attached private bathroom is equipped with basic bathroom amenities and running hot & cold water facility too. Adequately spacious A/c rooms are the budget rooms of the hotel well suitable for leisure travelers, business travelers and small groups. The rooms are provided with the option of a queen sized bed or twin beds to choose from. The vitrified tile floored rooms are equipped with window side coffee table, chair, space for work desk and in-room cabinet for safe keeping. Relax by the window side and let loose yourself in the flow of the culture of this city. The décor of the room is given local touch with use of local artwork and style. The fully furnished attached bathroom has hot and cold running water facility and provided with essential bathroom toiletries. At your comfort look up to – hi-speed internet access, color television, direct dial STD/ISD calling facility, 24 hr room service, complimentary newspaper and laundry service. Hotel has the provision to include an extra guest on chargeable basis. 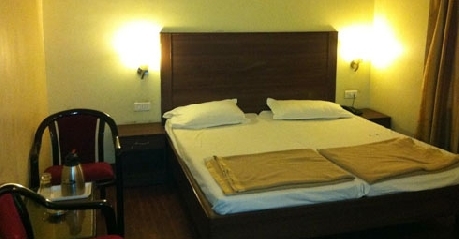 The elegantly spacious A/c Deluxe rooms are affordable budget rooms. These are frequently booked by families and groups to stay in Varanasi. The wooden floor tiled rooms are simple yet elegant in its ambience. There is a king sized double bed, executive work desk, coffee table and sofa chairs. It includes an extra member with you in the room by paying some extra charges as per hotel basis. The stylish attached bathroom has hot & cold running water facility and essential bathroom luxury toiletries. The luxury stay is maintained by color television with satellite channels for your entertainment, internet access for browsing and STD/ISD calling telephone to stay connected. Complimentary newspaper, in-room safe, laundry service and 24 hr room service are at your hospitality. The room windows will keep you engaged in the city hustle outside. Nar Indra in Varanasi has 54 well decorated rooms that are provided with amenities such as en-suite bath, 24 hours extensive room services, colored television placed in an apt corner, telephone and maid service to maintain the quality of the rooms. Annapurna is the exclusive multi-cuisine fine dining restaurant of Hotel Nar-Indra. The restaurant serves a variety of Indian, Chinese, Continental and Mexican delicacies. The warm and soothing ambience is maintained with patterned flooring and bold color dining furniture.